Muscles that position the pectoral girdle are located either on the anterior thorax or on the posterior thorax ([link] and [link]). The anterior muscles include the subclavius, pectoralis minor, and serratus anterior. The posterior muscles include the trapezius, rhomboid major, and rhomboid minor. When the rhomboids are contracted, your scapula moves medially, which can pull the shoulder and upper limb posteriorly. Similar to the muscles that position the pectoral girdle, muscles that cross the shoulder joint and move the humerus bone of the arm include both axial and scapular muscles ([link] and [link]). The two axial muscles are the pectoralis major and the latissimus dorsi. The pectoralis major is thick and fan-shaped, covering much of the superior portion of the anterior thorax. 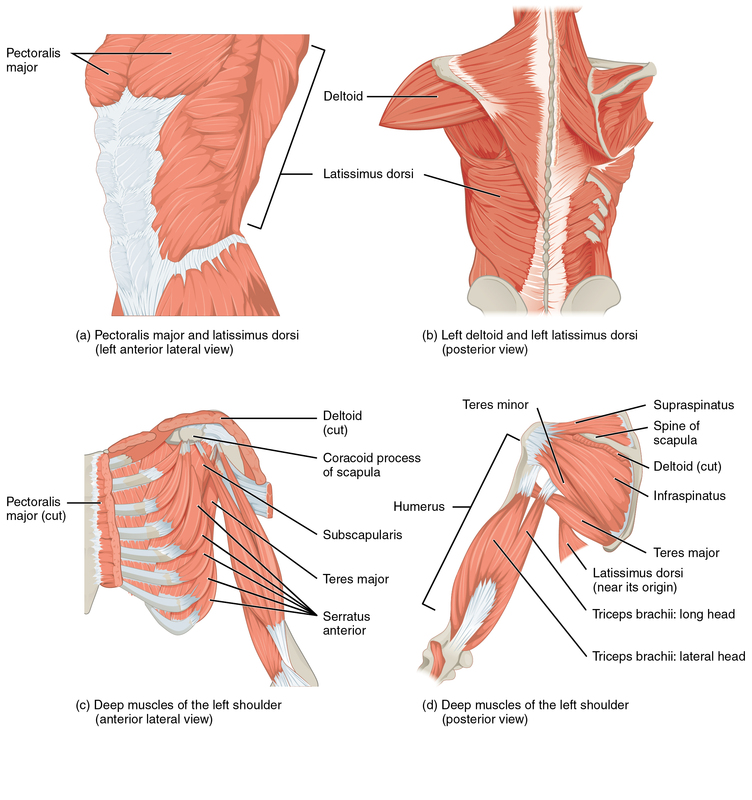 The broad, triangular latissimus dorsi is located on the inferior part of the back, where it inserts into a thick connective tissue shealth called an aponeurosis. (a, c) The muscles that move the humerus anteriorly are generally located on the anterior side of the body and originate from the sternum (e.g., pectoralis major) or the anterior side of the scapula (e.g., subscapularis). (b) The muscles that move the humerus superiorly generally originate from the superior surfaces of the scapula and/or the clavicle (e.g., deltoids). The muscles that move the humerus inferiorly generally originate from middle or lower back (e.g., latissiumus dorsi). (d) The muscles that move the humerus posteriorly are generally located on the posterior side of the body and insert into the scapula (e.g., infraspinatus). The biceps brachii, brachialis, and brachioradialis flex the forearm. The two-headed biceps brachii crosses the shoulder and elbow joints to flex the forearm, also taking part in supinating the forearm at the radioulnar joints and flexing the arm at the shoulder joint. Deep to the biceps brachii, the brachialis provides additional power in flexing the forearm. Finally, the brachioradialis can flex the forearm quickly or help lift a load slowly. These muscles and their associated blood vessels and nerves form the anterior compartment of the arm (anterior flexor compartment of the arm) ([link] and [link]). The muscles originating in the upper arm flex, extend, pronate, and supinate the forearm. The muscles originating in the forearm move the wrists, hands, and fingers. The muscles in the anterior compartment of the forearm (anterior flexor compartment of the forearm) originate on the humerus and insert onto different parts of the hand. These make up the bulk of the forearm. From lateral to medial, the superficial anterior compartment of the forearm includes the flexor carpi radialis, palmaris longus, flexor carpi ulnaris, and flexor digitorum superficialis. The flexor digitorum superficialis flexes the hand as well as the digits at the knuckles, which allows for rapid finger movements, as in typing or playing a musical instrument (see [link] and [link]). However, poor ergonomics can irritate the tendons of these muscles as they slide back and forth with the carpal tunnel of the anterior wrist and pinch the median nerve, which also travels through the tunnel, causing Carpal Tunnel Syndrome. The deep anterior compartment produces flexion and bends fingers to make a fist. These are the flexor pollicis longus and the flexor digitorum profundus. The muscles of the deep posterior compartment of the forearm (deep posterior extensor compartment of the forearm) originate on the radius and ulna. 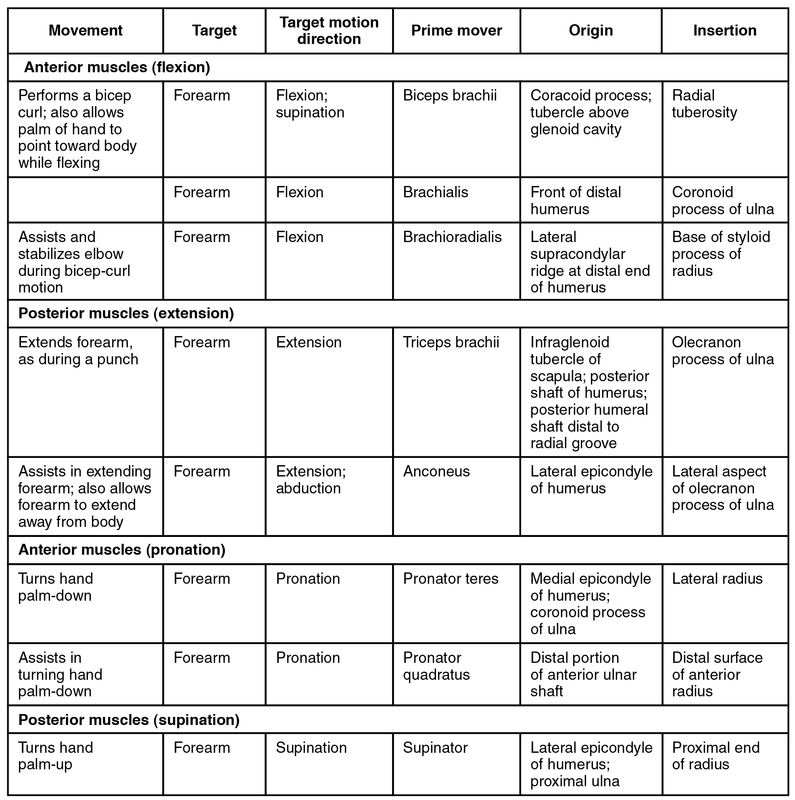 These include the abductor pollicis longus, extensor pollicis brevis, extensor pollicis longus, and extensor indicis (see [link]). 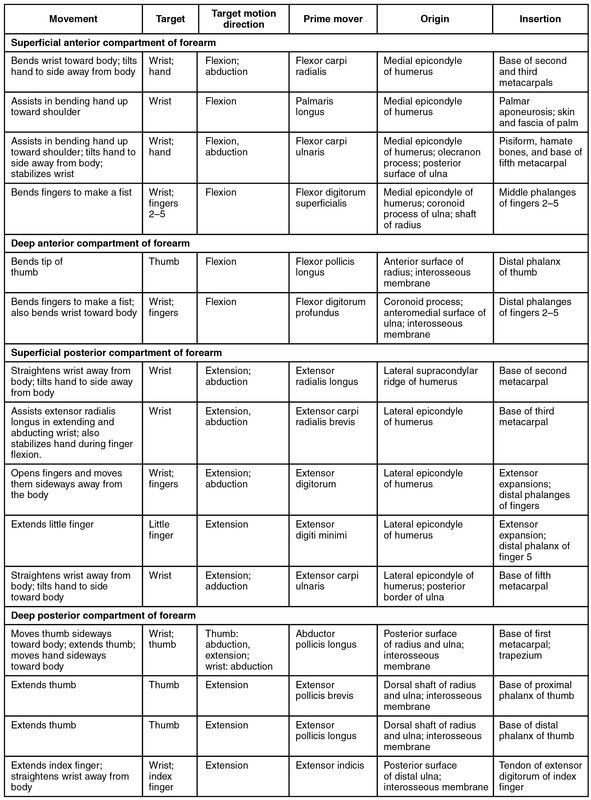 The intrinsic muscles of the hand both originate and insert within it ([link]). These muscles allow your fingers to also make precise movements for actions, such as typing or writing. These muscles are divided into three groups. The thenar muscles are on the radial aspect of the palm. 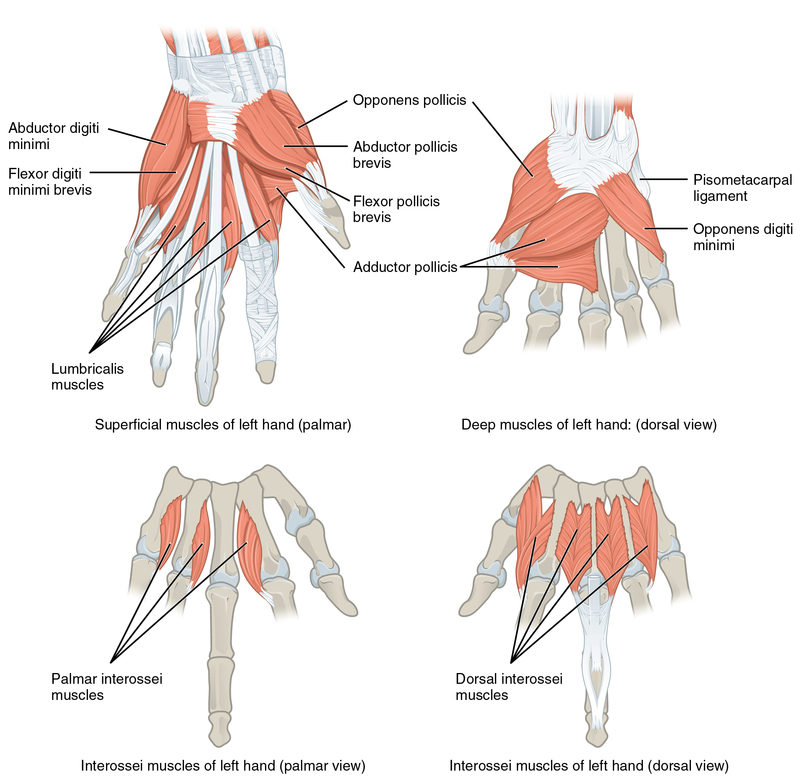 The hypothenar muscles are on the medial aspect of the palm, and the intermediate muscles are midpalmar. The intrinsic muscles of the hand both originate and insert within the hand. These muscles provide the fine motor control of the fingers by flexing, extending, abducting, and adducting the more distal finger and thumb segments. The rhomboid major and minor muscles are deep to the ________. 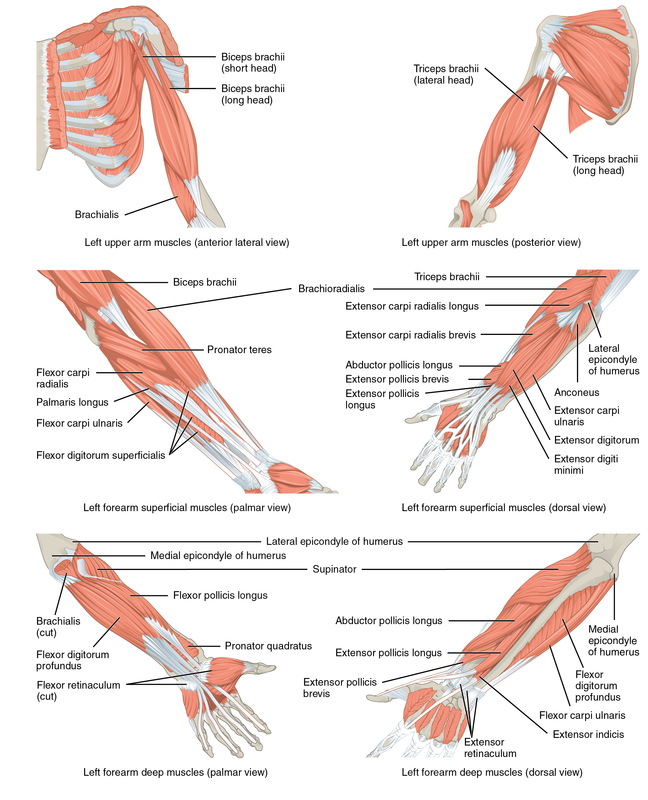 Which muscle extends the forearm? What is the origin of the wrist flexors? Which muscles stabilize the pectoral girdle? The tendons of which muscles form the rotator cuff? Why is the rotator cuff important? Tendons of the infraspinatus, supraspinatus, teres minor, and the subscapularis form the rotator cuff, which forms a foundation on which the arms and shoulders can be stabilized and move. List the general muscle groups of the shoulders and upper limbs as well as their subgroups. The muscles that make up the shoulders and upper limbs include the muscles that position the pelvic girdle, the muscles that move the humerus, the muscles that move the forearm, and the muscles that move the wrists, hands, and fingers. 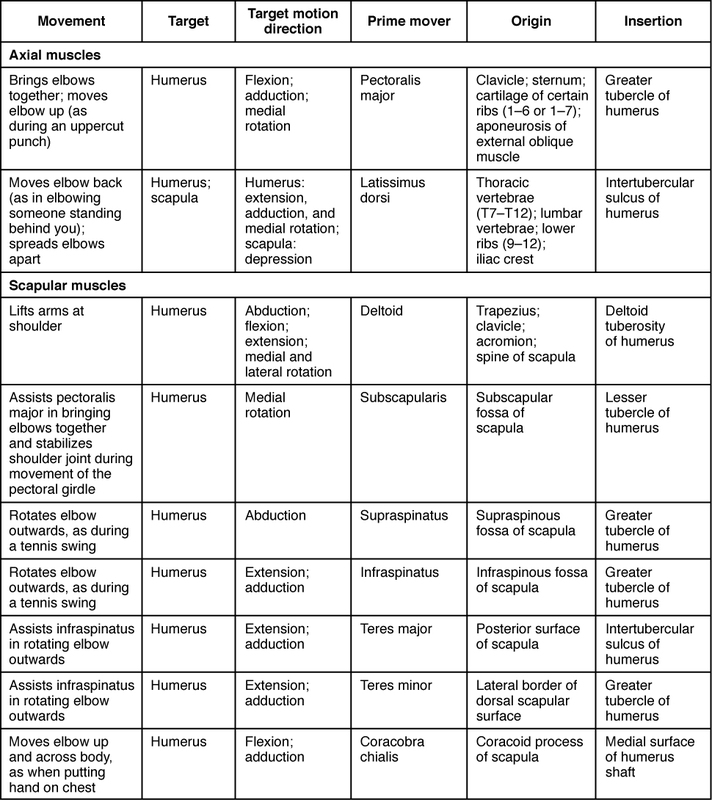 Muscles of the Pectoral Girdle and Upper Limbs by OpenStaxCollege is licensed under a Creative Commons Attribution 4.0 International License, except where otherwise noted.